In a large bowl, whisk together the flour and the semolina. Create a well in the center and add the eggs and egg yolks. Using a fork, break up the eggs then gradually start to draw flour from the edges of the well into the mixture. When the dough gets too firm to mix with the fork switch to mixing with your hands. Continue to work in flour until the dough no longer sticks to your hands; you may not need to incorporate all of the flour. Transfer the dough to a lightly floured surface and knead the dough for 8 to 10 minutes or until it is smooth and pliable. If it isn’t a little pliable add some water until its still a firm ball, but has some give when kneeded.Wrap the dough tightly in plastic wrap and allow to rest for at least 30 minutes. If using a rolling pin: Divide the dough in half. Dust your surface with flour and sprinkle a bit on your rolling pin as well. Roll out the dough as thin and as evenly possible, adding flour as needed to prevent sticking. 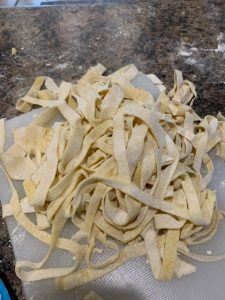 Use a paring knife to cut your dough into even ribbons, then set aside, dusting the cut pasta with more flour. Repeat with the remaining dough. 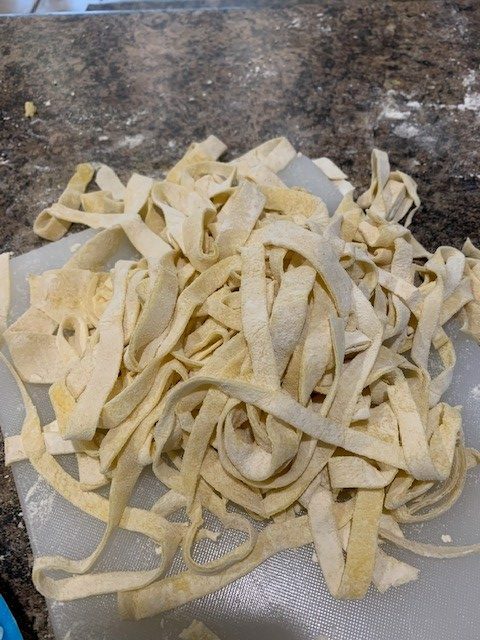 Cook the pasta in a large pot of generously salted boiling water, checking for doneness after just 1 minute; fresh pasta cooks very quickly. As soon as it is just al dente, no more than 3 or 4 minutes, drain, reserving some of the cooking water if desired for saucing the pasta. Toss with your sauce, loosen with some of the reserved cooking water as needed and serve immediately. Basically you brown and drain the ground beef and sautée the onions and peppers. Then add the spaghetti sauce to the meat and leave on the stove to heat up the sauce. Meanwhile cook the pasta and drain the water off. Then add the pasta, corn, and cheese to the meat mixture and stir it all together. Can add onion, peppers, pimentos, celery, carrots, mushrooms, broccoli, etc. as desired. Cook chicken, cool and dice. Cook spaghetti. Lightly sauté desired vegetables. 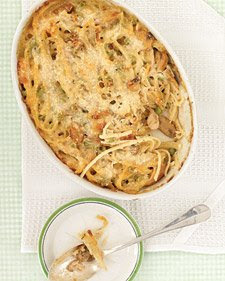 Add chicken, spaghetti, vegetables, to remaining ingredients. Bake in a 9×13 pan at 400 degrees until bubbly. Cook pasta and drain. Add remaining ingredients. Bake in an 8×8 dish at 400 degrees until eggs are set. Put oil in large skilled and cook ground beef. Drain. Ad chopped vegetables, tomato juice, ketchup, and water and seasonings. Cook until thick. Serve over spaghetti noodles. Brown round beef and garlic. Add tomatoes, tomato paste, pepper, and oregano. Cover and simmer about 20 minutes. Cook noodles. Heat oven to 350 degrees. 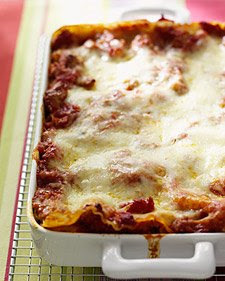 Alternate layers of meat sauce, noodles, and cheese in baking dish, beginning and ending with meat sauce. Bake for 30 minutes. Sprinkle with parmesan cheese. Brown and drain ground beef. Add salt, bullion cubes, water, Ketchup, and mustard. Simmer a few minutes. Raise heat and stir in flour mixture (flour and ½ cup cold water) until thickens. Remove from heat. Stir in sour cream, then noodles. Serve. Brown onions, peppers, and ground beef in a little oil. Drain. Add tomatoes and spices. Cook until juice thickens. 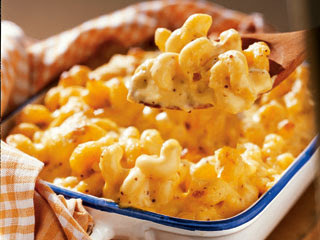 Cook elbow macaroni. Drain. Add to sauce. Pour into a casserole dish. Sprinkle cheese on top. Bake at 375 degrees until cheese is melted and pasta is heated through.